Many have an impression everything of value has already been found. Not true! Gemstones, gold, semi-precious stones and lapidary minerals are all over the place with some sitting right along highways and some have even been used in road bed material! A semi-precious gem known as spectralite is often found in large regions known as anorthosite complexes. The Laramie Range anorthosite complex in Wyoming has billions of carats of this gemstone sitting along the side of Highway 34 that runs from Laramie to Wheatland Wyoming through the center of the Laramie Mountains. In fact, many excellent specimens have been dug right out of the road bed material in the connecting Albany County Road 11 and 12. Albany 11 connects into US Highway 34 which cuts through the center of the Laramie Mountains near the northern edge of the Laramie Anorthosite Complex. This complex contains potentially billions of carats of spectralite along the highway - residents in this area describe boulders filled with this gem in their front and backyards (with some rattlesnakes). And not far from Highway 34, right along Albany county 11, are two kimberlites - one on a private ranch and the other right in the road. Either one could easily have diamonds. And, just a few miles south could be one of the largest colored gemstone deposits on earth. It lies south of Wyoming Highway 34 and just north of the 9th street road that connects Laramie to Iron Mountain, Wyoming. 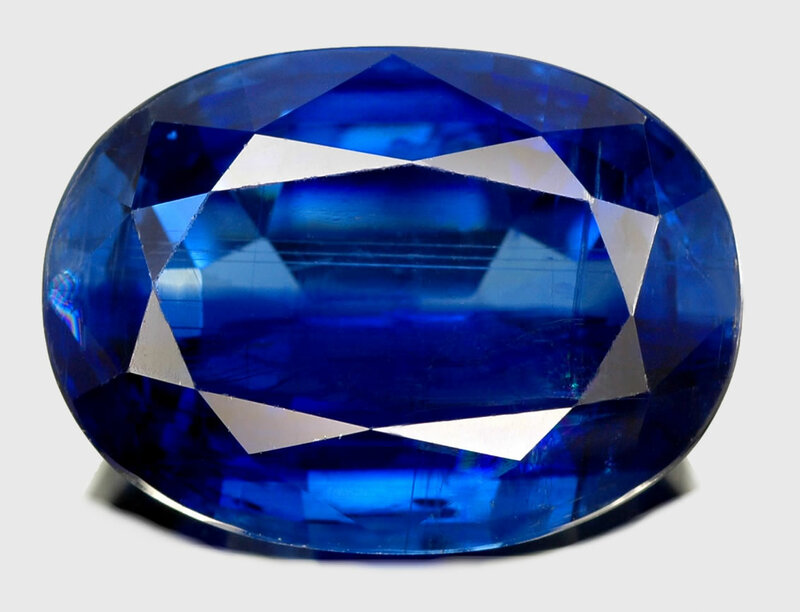 The 9th street gemstones are known as iolite. Iolite looks like tanzanite and like blue sapphire and one of the more under-valued gemstones. Based on trenching and exploration prior to World War II, the 9th street iolite deposit appears to host more than 2 trillion carats of the gemstone! Prior to Obama's taxes, most of us had no idea what a trillion meant. And a few miles north of Highway 35 is the Elmers Rock Greenstone belt where I found gold several years ago. And to the east of the gold occurrence, I found two large iolite deposits including the largest iolite gems on earth at Palmer Canyon and Grizzly Creek. The gold vein I sampled is cut by a stream, so there is some placer gold in the area also. And if you think that is amazing - both ruby and sapphire were found next to the Palmer Canyon iolite deposit. In this same area as well as not far from Highway 34 are considerable amounts of gem-quality kyanite as well as hundreds of millions of carats of kyanite in the Cooney Hills. And not far from the Sherman Mountains iolite deposit is a copper, gold, silver, molybdenum, tungsten, nickel deposit at what was known as the Strong mine. Mixed in between these two deposits is a very large titaniferous magnetite deposit containing considerable titanium, vanadium and iron. And along the edge of the anorthosite complex east of the Strong mine and the Sherman Mountain iolite deposit and not far from Chugwater and Farthing are diamond-bearing kimberlites. And some of these kimberlites contain pyrope garnet, chrome diopside and picroilmenite. West of those kimberlites, in the area of the titaniferous magnetite, are several cryptovolcanic structures that have geomorphic characteristics of kimberlite - could these be diamond deposits? They remain unexplored even though they are likely kimberlite. Think we are done? Nope. To the south, right along Interstate 80 is a 2-million ounce gold equivalent deposit at Silver Crown with scattered copper and zinc deposits. I could actually see the interstate from this deposit as well as the State Capitol in Cheyenne when I mapped this area. And there are drainages that cut through this deposit, so, drainages heading into Cheyenne should have placer gold (and probably diamonds). Across the interstate are several more cryptovolcanic structures that are likely kimberlites that remain unexplored. These include more than 50 anomalies I found while exploring for DiamonEx Ltd, the Wyoming Geological Survey, Bald Mountain Resources and Echo Bay Mines. These include the Twin Mountain depressions (41° 2'17.76"N; 41° 2'17.76"N) that are surrounded by carbonate-rich soil. In total I found more than 300 cryptovolcanic structures in southeastern Wyoming and northern Colorado, some of which have to be kimberlites. Just a few miles west, right along US highway 287, are several diamond-bearing kimberlites that yielded more than 130,000 diamonds (about 30% gems) including diamonds as large as 28.3 carats!!! AND creeks around this district are filled with diamonds, pyrope and spessartine garnets and chrome diopside. Few people have ever bothered to look. And all of this is within a short driving distance of Laramie, Wheatland and Cheyenne. Just recently, one prospector went digging in Rabbit Creek in Colorado downstream from the Sloan diamond pipes and found several diamonds including a flawless 5 carat gem diamond. He only had a gold pan to recover these diamonds. Over the years I found dozens and dozens of gemstone and gold deposits looking in the middle of no where as well as right along some highways and interstates, and even found gold in the Laramie City dump. There are even giant opals and opal deposits with lots of agates near highway 135 south of Riverton, and also another potentially giant opal and agate deposit around Douglas Wyoming that I described in my Gemstone Book that is unexplored! So, keep your eyes open as I left a lot of gemstones behind in Wyoming, but also found some gems and/or gold in Arizona, California, Colorado, Montana, New Mexico, Kansas and Alaska. So how did I find so many gemstone deposits and gold deposits? I kept and open mind and then applied science to find $billions in gemstones, diamonds and gold. Unfortunately, I found all those minerals and gold for other people and companies and I got nothing more than recognition and a salary. Oh well, maybe in my next lifetime. But you can still take advantage, as I reported where I found most of these in my books.